The 27-year-old is able to ride for victories on the CCC Team, now that Richie Porte has moved to another outfit. ADELAIDE, Australia (VN) — Patrick Bevin (CCC Team) stepped boldly into the winner’s circle Wednesday with a victory that’s been years in the making. 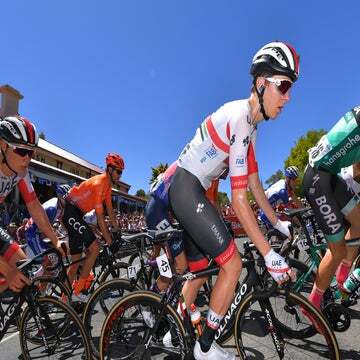 The highly touted New Zealander upset the sprinters in the second stage at the Santos Tour Down Under to barnstorm into the leader’s jersey and claim his first WorldTour win. After a season of riding in the shadow of Richie Porte, Bevin is taking full advantage of new leadership opportunities created by the demise of the once-mighty BMC Racing Team. BMC’s closure at the end of 2018 opened up some room for Bevin. Porte moved to Trek-Segafredo and BMC rides on, at least in spirit, with a new iteration as CCC Team. With Porte gone, Bevin has space to move. And so far at the Tour Down Under, he’s riding free and unfettered. Bevin, 27, rode into the breakaway in Tuesday’s opening stage, earning him the most aggressive rider prize. More importantly, he got five seconds in mid-race time bonuses. Add his stage-winner bonus Wednesday and he’s suddenly 15 seconds ahead of most of the GC favorites. And in a race that can go down to count-backs, Bevin suddenly has a target on his back. Still only 27, Bevin’s been racing for a decade. He raced four seasons with Bissell and another with Avanti before bumping to the WorldTour with Slipstream in 2016. In 2018, he moved to BMC and became part of the team’s formidable team time trial squad. The mood was ecstatic around the CCC Team van post-stage. No one expected the team’s first WorldTour win to come so early in the season. If he hopes to win the Tour Down Under, Bevin will need as big a lead as he can get. Thursday’s hilly stage on a circuit finale presents a stout challenge before Sunday’s uphill, race-ending finish at Old Willunga Hill. Who will be the favorite there? Richie Porte, of course.